Welcome! The volunteers and organizations involved with the 29-mile Perry Lake Hiking Trail thank you for taking the time to stop by and learn more about this outstanding recreational resource located here in Northeast Kansas. Perry Lake Trail is often a surprise for first time visitors. The trail offers a range of terrain and difficulty from easy, gentle slopes in the south to rugged, varying elevation changes in the north. Many folks refer to the Perry Lake area as the "Little Ozarks". A tribute to the beautiful, tree-covered hills that characterize the Delaware River watershed. 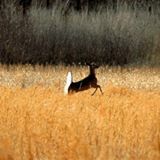 Wildlife is abundant in the area and lucky hikers are likely to see deer, turkey, waterfowl, reptiles, small mammals and even the occasional Bald Eagle! There are many places along the trail that offer scenic views of the lake, with some portions very close to water's edge. Perry Lake Trail is a short drive from Lawrence, Topeka or Kansas City. From Topeka or Lawrence, US 24 highway will take you to Perry, Kansas and just below Perry Dam. From the town of Perry, the trail area is accessed from various points along Ferguson Road. With the exception of an along-the-road portion of trail that completes the loop, Perry Lake Trail is located entirely on Corps of Engineers land. Click here to view the Corps of Engineers website and additional information about Perry Lake and Perry Lake Trail. Perry Lake Trail is designated for hiking only. The Corps website also provides information about the many other hiking, biking, equestrian and ATV trails available at Perry Lake.